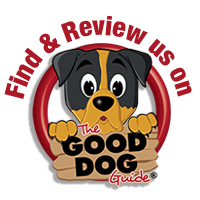 Here are The Good Dog Guide logos with links you can include on your own website. 'Find & Review Us' logos. 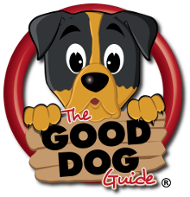 You can include a direct link to your Good Dog Guide listing page with the logo, just copy & paste your listing page URL in to the code, where it states 'YOUR LISTING PAGE URL HERE'. 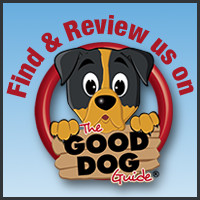 If you would like us to email your Good Dog Guide listing page URL please contact us with your business name. To place a link on your website direct to our home page please choose the logo you would like to display, using the code included. You can change the width & height of the logo if needed. Thank you for linking to The Good Dog Guide. Use the code below to link this logo directly to your Good Dog Guide listing page. Replace COPY YOUR LISTING PAGE URL HERE with your page URL.